Jeju-do (transliterated Korean for Jeju Province, short form o Jeju Special Autonomous Province or Cheju Island) is the anerlie special autonomous province o the Republic o Korea, situatit on an coterminous wi the kintra's lairgest island. Jeju-do lees in the Korea Strait, soothwast o Jeollanam-do Province, o which it wis a pairt afore it became a separate province in 1946. Its caipital is the ceety o Jeju Ceety. 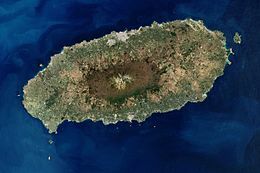 The island contains the natural Warld Heritage Steid Jeju Volcanic Island an Lava Tubes. ↑ Transliterated Korean names are preferred tae Inglis equivalents; see Wikipedia:Naming conventions (Korean)#Place names. ↑ "Unesco names World Heritage sites". BBC News. June 28, 2007. Retrieved May 6, 2010. This page wis last eeditit on 7 Julie 2017, at 17:37.